Jellyfish are marine invertebrates that look very fragile since more than 95% of their bodies consist of water molecules; their transparency allows them to be completely camouflaged in the sea. They live in the open sea, where they move around on the currents, although they can also move by rhythmically beating their umbrella mass. 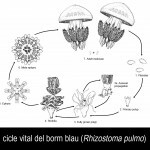 They are members of the group called cnidarians (cnide-nettle in Greek), along with anemones and corals, and characteristically have stinging cells, called cnydocists, covering their tentacles which they use for defence and to catch their food. There are around 200 different species of jellyfish, which range in size from 2 cm to 2 m in diameter, and they can have tentacles as long as 40m. 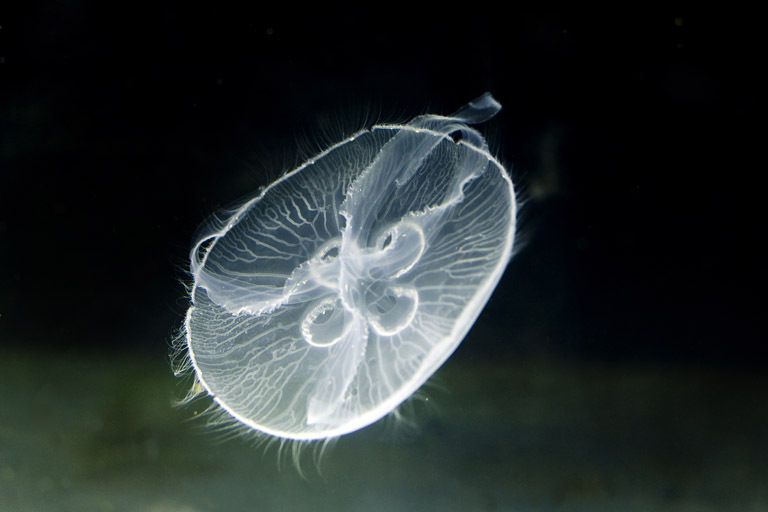 During their life cycle many jellyfish have two different life forms, just as butterflies and caterpillars are two different forms, so we could call them butterflies of the sea. 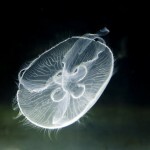 One life form is fixed to the seabed, the polyp, and the other, the jellyfish, lives freely in the open sea where it moves on the marine current. Adult jellyfish reproduce sexually and create larvae, the planulas, which attach themselves to the sea bed to form polyps. 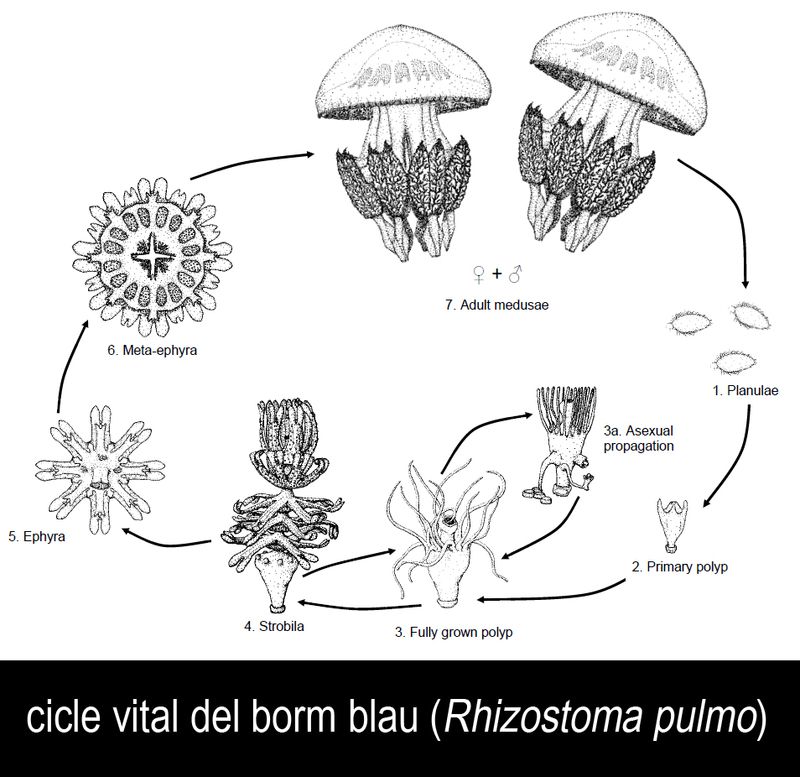 These polyps reproduce asexually through a germination process and under certain environmental conditions will generate the small ephyras that eventually become jellyfish. During the spring and summer the temperature of the costal water is similar to that of the water at sea. 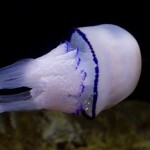 The adult jellyfish, that have spent the year on the sea bed in the form of a polyp, are dragged by the surface marine currents towards the coast. The changing environmental conditions, with milder winters and hotter summers, and the reduction in the number of natural predators, such as turtles and tuna, due to over-fishing, are some of the factors causing an increase in swarms of jellyfish along the beaches. 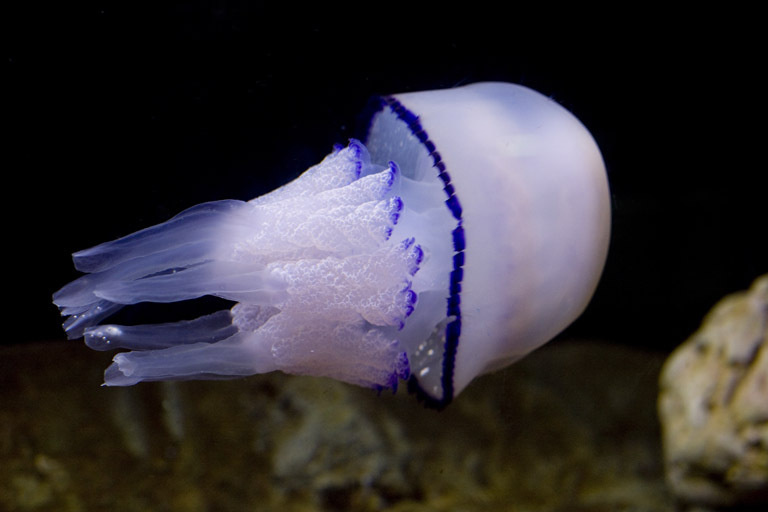 In collaboration with: The Spanish National Research Council (CSIC), through the Marine Science Institute and Barcelona Aquarium, has provided information so that it can raise awareness about jellyfish and the need for society to preserve the marine environment.